Hurvin Anderson’s latest exhibition, New Works, opened October 15th, 2013, at Thomas Dane Gallery in London’s West End. As the title would suggest, New Work is a thin exhibition of really nice paintings, if you’re into that kind of thing. Which I am. 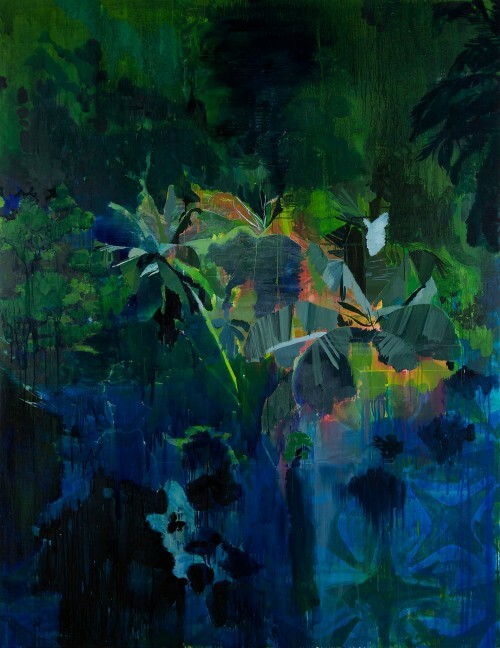 While Anderson’s conceptual thrust was weak – abstractly painted images of anonymous fern and banana trees, both memories of the artist’s Caribbean heritage and wider hooks into the European and American imagination of exotic and leisure zones – the work itself takes over from there with optical plenty. The exotic makes for compelling paintings, and Anderson provides a pleasure range of vibrant greens and steely blues. Even the more photographic works, with blocky figures and traced text, are full of color and life. I liked Hurvin Anderson’s paintings. I thought they were beautiful landscapes that used their paint, took advantage of its painterly possibilities with alternatively wet slashes and hard scrapes, but never strayed far from highly composed photographic imagery. The grid appeared in almost every painting shown in New Works and succeeded both a compositional and conceptual structure beneath the paint, tying the loose strokes to a formalist history of image production rather than overt abstract expression. Don’t worry, it’s okay to like it.